Suffolk County Crime Stoppers and Suffolk County Police First Squad detectives are seeking the public’s help to identify and locate two men who robbed a laundromat in Amityville earlier this month. Amityville, NY - December 24th, 2014 - Suffolk County Crime Stoppers and Suffolk County Police First Squad detectives are seeking the public’s help to identify and locate two men who robbed a laundromat in Amityville earlier this month. 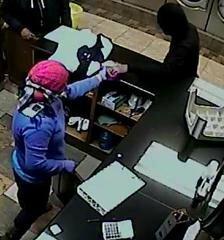 Two men entered Village Laundromat, located at 536 Broadway, on December 4, 2014 at approximately 3:50 a.m., displayed a handgun and demanded money. An employee handed the men cash from a safe and they fled on foot northbound on Broadway. The two men are described as black and were wearing dark-colored clothing. Subject: LongIsland.com - Your Name sent you Article details of "Duo Wanted for Robbing Amityville Laundromat"